The University of New Brunswick has enjoyed a long-standing relationship with Mzuzu University in Malawi, in southeast Africa. Since 2007, the UNB has sent more than 100 undergraduate and graduate students to Malawi under the Queen Elizabeth Scholars (QES) program. Dr. Robert Kingdon, instructor and undergraduate director of geodesy & geomatics engineering (GGE) at UNB, first travelled to Mzuzu University as a UNB graduate student in 2007. He recently returned to Mzuzu campus and was encouraged to see how much had changed in eleven years. In 2007, Mzuzu University’s land management department consisted of a single aging surveying instrument used to measure angles and two levelling staffs. Today, the faculty has doubled, the building size has quadrupled and is now outfitted with a computer lab, and the department has an extensive array of surveying equipment— largely thanks to donations from the Canadian surveying community arranged by UNB GGE students. In Malawi, to obtain a bachelor’s degree is a great accomplishment and is often the only academic credential of university faculty. Although only those fortunate enough to travel to foreign universities receive specialized training and advanced expertise in their field, the lecturers at Mzuzu University bring extensive practical entrepreneurial experience into the classroom. Dr. Kingdon spent three months working with colleagues in Malawi to improve the geospatial positioning system from the 1950s that produced results 30 metres off its mark. He also worked with a Malawian company, Thomson Consult and the Centre of Geographic Computation, to develop a prototype smartphone mapping product. He traveled throughout Malawi to assess the geospatial positioning needs of local farmers, city planners and entrepreneurs. Malawians could readily see the potential of geospatial technology in their everyday lives. Plantations would benefit from access to accurate Global Navigation Satellite System (GNSS) positioning to map their boundaries and control operations and better height systems would improve irrigation planning in sloping fields. It would enable community organizers to find centrally located sites to hold farmers’ markets with the best consumer visibility and collect data how far farmers are required to travel to sell their goods. A local non-government healthcare manager envisioned using accurate positioning systems for drone navigation to deliver medical supplies to remote villages. The relationship between the departments of Mzuzu land management and UNB GGE has been reinvigorated by Dr. Kingdon’s recent visit. Graduate GGE students from UNB have continued to work remotely to improve the positioning system Dr. Kingdon developed with Thomson Consult. Identified as an economical way to obtain high quality GNSS gear, UNB donated two SwitfNav Piksi “build-your-own GPS” kits to Mzuzu University. Dr. Kingdon collaborated with Mzuzu’s land management faculty to build, test and maintain surveying equipment and to develop curriculum that would train new generations as well. Businesses and government agencies in Malawi have since approached Mzuzu faculty asking for assistance in purchasing and learning how to use GPS kits like those donated by UNB. Still, there is much to do. 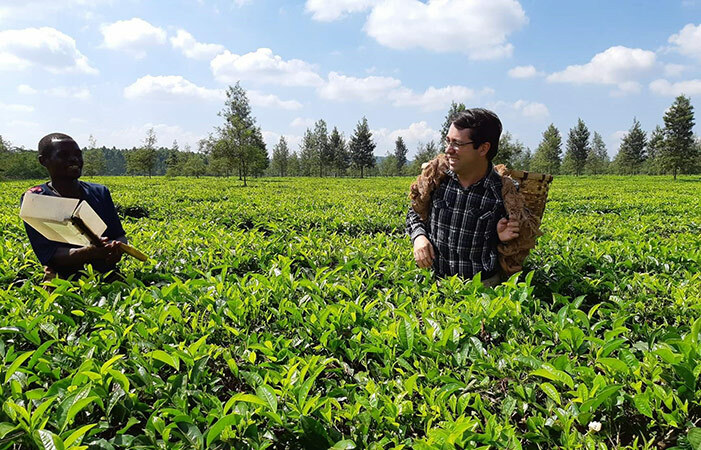 Photo: Dr. Robert Kingdon gathering tea leaves at the Kawalazi Estate Company’s tea plantation in northern Malawi. Credit: Robert Kingdon.